Fourth annual restaurant promotion organized by the Shreveport-Bossier Convention and Tourist Bureau will include more than 50 local restaurants, 10 one-night-only dining experiences, and more. 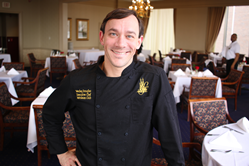 Executive Chef Wesley Douglas of The Petroleum Club in Shreveport will oversee a Brazilian steak night during 318 Restaurant Week. This year’s event will include lunch and dinner specials at more than 50 participating restaurants as well as 10 one-night-only dining experiences. 318 Restaurant Week, an annual citywide promotion of local restaurants organized by the Shreveport-Bossier Convention and Tourist Bureau and its partners, will return, March 18-23, 2019. This year’s event will include lunch and dinner specials at more than 50 participating restaurants as well as 10 one-night-only dining experiences. Sponsors of 318 Restaurant Week 2019 include the Louisiana Seafood Promotion and Marketing Board, ANECA Federal Credit Union, KSLA, and Hilton Shreveport. Complete information on 318 Restaurant Week, including a list of daily $10 lunch and $20 dinner specials as well as ticket information for the special dining events, can be found at http://www.318RestaurantWeek.com. One-night-only dining experiences for 318 Restaurant Week 2019 will include: “Crossroads of the South” at Bella Fresca, Monday, March 18; “Brazilian Steak Night” at The Petroleum Club, Tuesday, March 19; “Where There’s Smoke” at Real BBQ & More, Tuesday, March 19; “Full Moon, High Tide: A Spring Equinox Seafood Experience” at Shreveport Aquarium, Wednesday, March 20; “Navigating The Port Grill” at The Port Grill, Wednesday, March 20; “Dining in the East Bank District” in Bossier City’s East Bank District, Thursday, March 21; “Matters of the Heart: A Love of Food and Wine” at Market 104, Thursday, March 21; “A Night in Peru” at El Mono LA, Friday, March 22; and “A Party You Can’t Refuse” at Parish Taceaux, Saturday, March 23. For a complete description of each event or to purchase tickets in advance, visit http://www.318RestaurantWeek.com. Space is limited for each of the one-night-only events and advance ticket purchase is required. New for 2019 is the 318 Crawfish Crawl sponsored by Boomtown Casino and Hotel. The Crawfish Crawl will kick off on Saturday, March 16 and will run through Friday, May 31. Participants will be encouraged to visit various local crawfish joints and receive “passport stamps” from each. Participants who successfully return their completed passport to the Downtown Shreveport Visitor Center at 629 Spring Street will be entered to win a Shreveport-Bossier staycation and a $100 Visa gift card. The public can sign up to receive regular updates from 318 Restaurant Week organizers by visiting http://www.318RestaurantWeek.com and selecting “Contest and Updates.” The public can also enter to win valuable gift cards from a variety of local restaurants by visiting the website. Regular updates from 318 Restaurant Week organizers and participating restaurants will also be shared on Facebook at http://www.facebook.com/318restaurantweek and on Instagram at http://www.instagram.com/318restaurant. Diners who take part in 318 Restaurant Week festivities are encouraged to share their experiences on social media using the hashtag #Eat318. For more information on planning a visit to Shreveport-Bossier, including information on hotels, attractions, restaurants and events, visit http://www.Shreveport-Bossier.org or call 800-551-8682.